Enter 400 North Ervay, and the scent of fresh paper and stamps fill the air. While the downtown U.S. Post Office (at the corner of Ervay and Bryan Streets) has operated from the same location for over 80 years, few people recall when the upper levels of this landmark structure were bustling with activity. Today we explore the history of the U.S. Post Office and Courthouse and its recent rebirth as luxury residences. 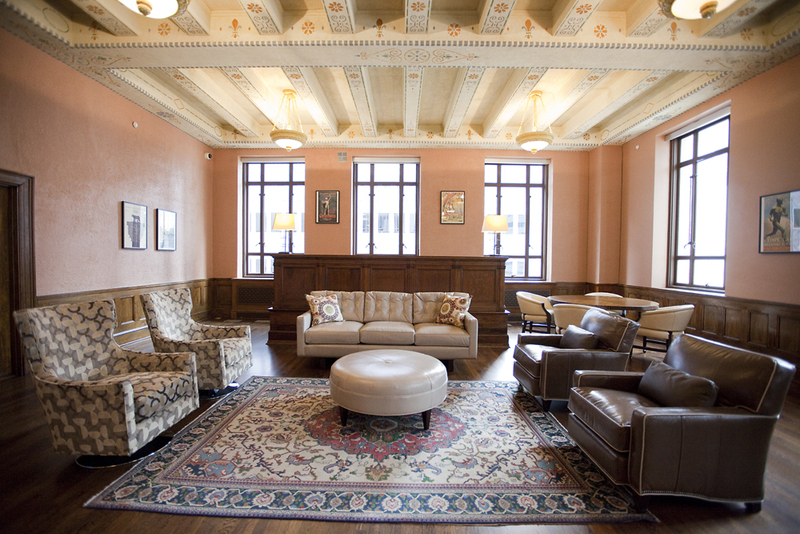 The U.S. Post Office and Courthouse has been transformed into 78 residential units. Constructed in 1888, the original Federal Building located at Ervay and Main Street (later occupied by the Mercantile National Bank Building) served the young city with a post office and consolidated federal offices. Despite new building expansions every few years, rapid growth of the city’s commerce and population made the old building consistently inadequate. Federal government space was at a premium, and various departments leased office space throughout downtown. The building’s location on Main Street (and the government’s lack of foresight to buy land for expansion) made any new additions prohibitively expensive. Dallas was placed on a waiting list to receive funds for a new, larger building to be constructed in another area of town. By 1913 plans were under way to convince the government to construct a new building, and a site owned by H.D. Lindsley at Bryan Street, Ervay Street, Cottage Lane (Federal Street), and Masten Street (St Paul) was the winning choice out of five contendors. The site was previously the location of a 4-room frame house serving as the first home of Ursaline Academy (between 1874–1882). Purchased at a cost of $250,000, the land became one of the most valuable pieces of property in the city. The new U.S. Post Office and Courthouse (center) was planned for a site north of the commercial district, replacing the old Federal Building along Ervay at Main & Commerce Streets. 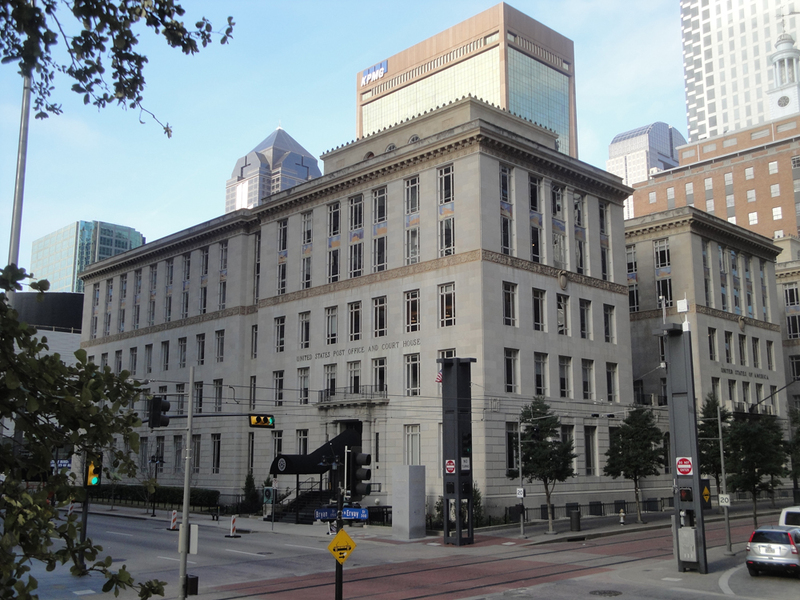 In 1914 a special bill in Congress passed appropriating $1,250,000 for a new Federal Building in Dallas. Local news announced that “immediate construction” would begin on the structure. However, the outbreak of war in Europe halted any progress on the building, and all federal building projects were placed on hold. The site was cleared and used periodically as a military drill ground — including demonstrations by the Bryan Street High School cadet corps and Forty-Third Infantry. Despite an increase in surrounding property values, by 1921 nearby residents were complaining about a high fence that had been erected around the empty lot. Prospects by this time looked better for the new Federal Building, and the Secretary of the Treasury was presented with initial plans for the site. By 1924 a new session of congress looked more apt to support the project, but funding problems and political infighting again delayed progress. Cottage Lane — located behind the future project — was renamed Federal Street in anticipation of construction, and was a way to disassociate the area from its notorious “Stringtown” (a red light district) past. Finally, the Public Buildings Act of 1926 allocated the $1,250,000 needed for the building. After 19 years and numerous delays, construction on the project began on June 30, 1929. 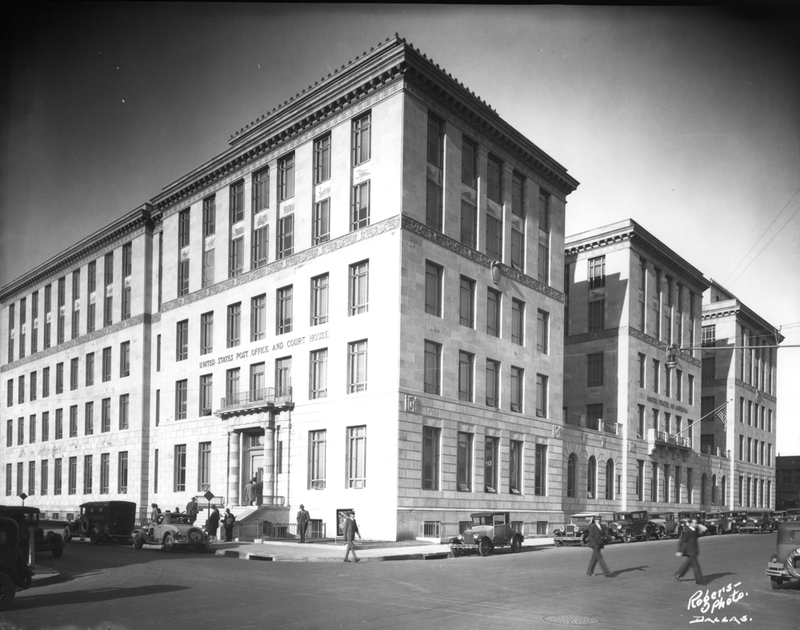 Upon opening in November 1930 as the largest Federal building in the South, agencies from around town moved into the new structure and the old Federal Building a few blocks away was abandoned. Designed by the Supervising Architect of the Treasury Department, the building was planned as a 5-story limestone Italian Renaissance structure spanning the entire block fronting Bryan Street. The U.S. Post Office occupied the entire ground floor (replacing a temporary post office on Young Street that had been erected) and other Federal offices were housed on upper levels. Prior to completion, the new building was promised to be one of the most beautiful structures ever erected by the Federal government. 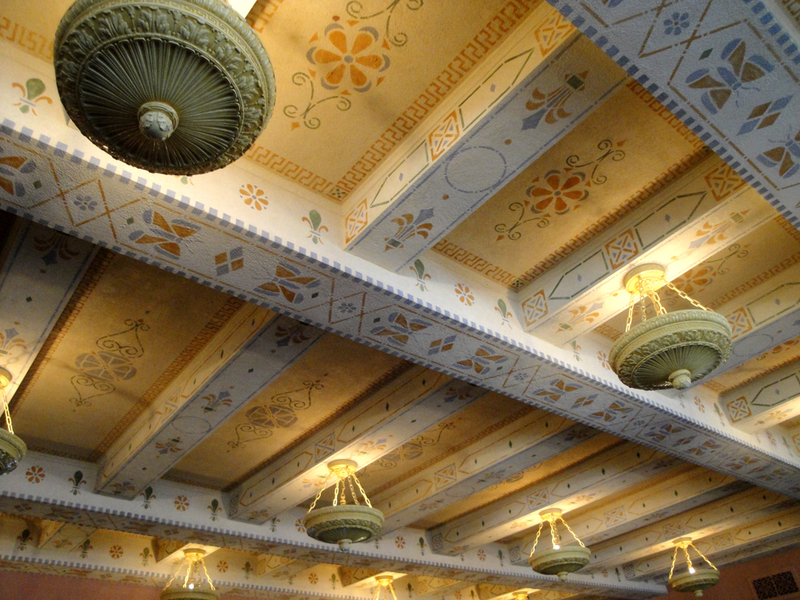 The ceilings on the ground floor and third floor courtrooms feature Southwestern motifs and have been completely restored. Set back fifteen feet from Ervay Street (to allow for a road widening that never happened) and ten feet on St Paul and Bryan Streets, the U.S. Post Office and Courthouse was accessed through entrances on both St Paul and Ervay. Upon entering the building, the ground floor featured white Georgian marble and green terrazzo floors extending the length of the building; map murals depicting Texas and Dallas were placed above the doorways. Flanking both sides of the eighteen-foot-wide corridor, postal boxes and service windows were set below decorative iron cages, attending to customers with parcels and packages. The Southwestern motifs were carried through to the painted ceiling, from which decorative light fixtures hung. The ground floor features rows of service windows on either side of a wide corridor. 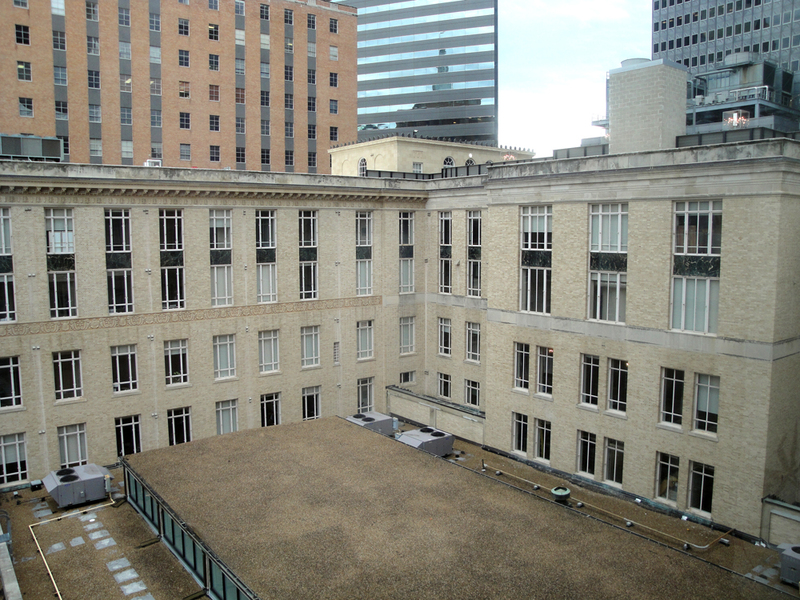 Upper levels — accessed by two elevators in each side wing — contained offices for all of Dallas’ forty Federal bureaus and agencies; two United States District Courts along with two District Judges also had quarters in the building. The side corridors — extending along St Paul and Ervay Streets — were originally planned to only rise three levels, but additional funds were appropriated allowing for five full floors. A basement level contained additional offices and mechanical rooms (later converted to parking facilities). The narrow U-shape of the upper levels allowed a large, central area — occupied by the Post Office’s processing facility — to be flooded with natural light through skylights. A series of loading bays along Federal Street made it a very efficient distribution point. The building is U-shaped with the post office in the center of the courtyard. Exterior ornamentation included a series of panels under fifth floor windows depicting the development of the United States mail service — pony express, stagecoach, steam railroad, steamship, ocean liner, fast locomotive, motor truck and air mail (installed in no particular order). Intended to wrap all the way around the building, the inner courtyard instead featured marble panels. These panels — along with other touches of color scattered on the exterior — added some variation to the building. Architectural details can be seen along the Bryan Street facade. 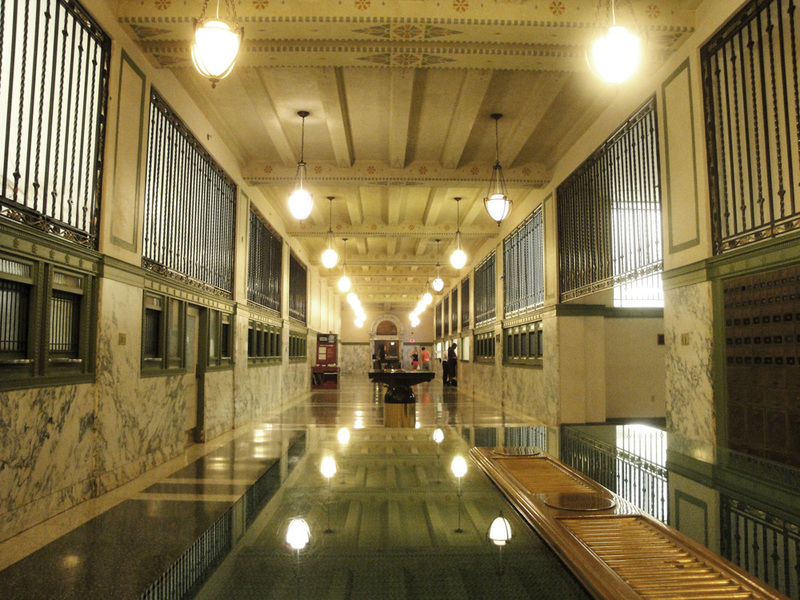 The main courtroom on the third floor was designed by Irving D. Porter and housed the United States District Court. Specifically designed for the building and featuring decorative panels and intricate ceilings, large windows on three sides allowed ample natural light into the room. 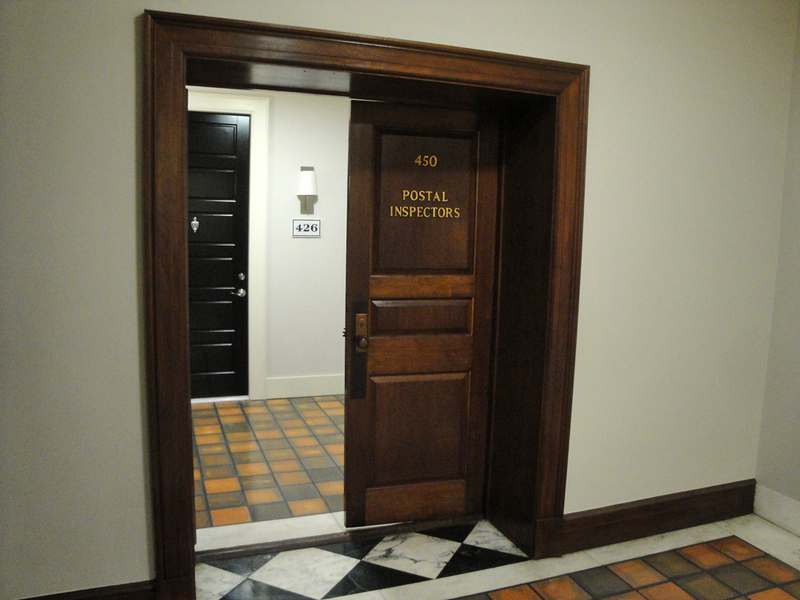 The courtroom opened onto the public corridor through three sets of swinging doors; jury and judges chambers were accessed through hidden doors along the walls. 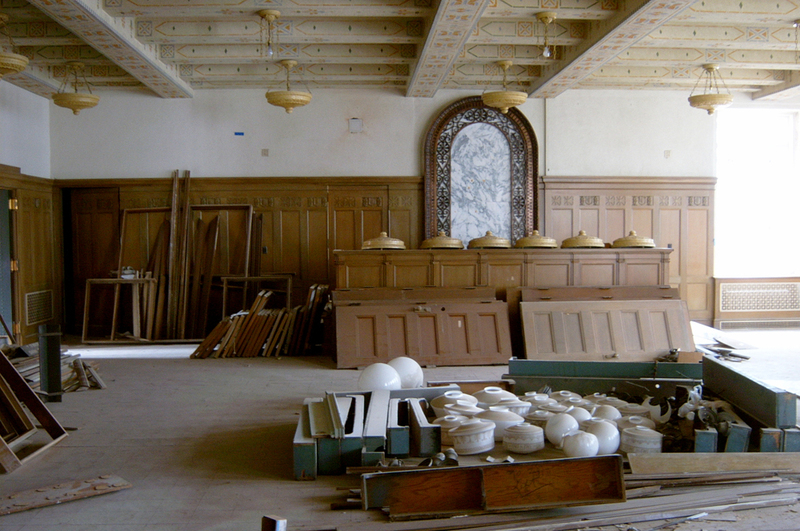 The restored courtroom contains the original light fixtures, painted ceiling, and judge’s bench. Judge Sarah T. Hughes — the first woman to serve as a federal district judge in Texas — was one of the more notable members presiding over this courtroom; on November 22, 1963, she was called upon to administer the oath of office to Lyndon B. Johnson after the assassination of President Kennedy. Over the decades, the courtroom heard many cases of national importance. In 1935 everyone who helped or conspired with Bonnie Parker & Clyde Barrow — including their parents — were tried and sentenced during the “harboring trial”. Many years later in the same courtroom, Judge Hughes would preside over the three-judge panel that overturned Texas’s abortion laws in a decision upheld by the U.S. Supreme Court in Roe v. Wade. 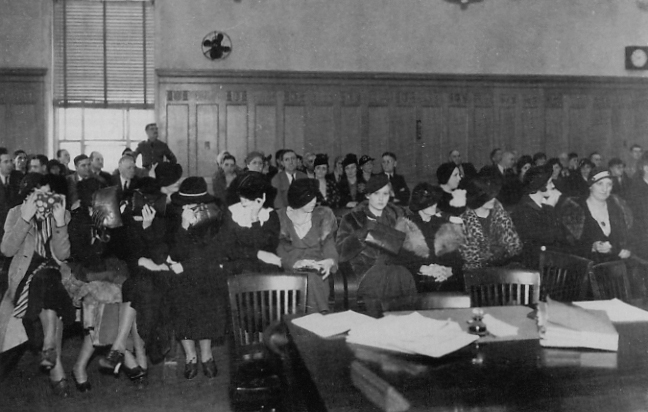 Women accused of harboring Bonnie & Clyde wait in the courtroom. Much like its predecessors, the new U.S. Post Office and Courthouse ran out of space shortly after opening. A new Terminal Annex Post Office (at the corner of Commerce & Houston Streets) was opened in 1937 to handle the sorting of mail; additional floors were added there when more space was needed. Federal agencies and bureaus — such as the Secret Service and Treasury Department — relocated between government buildings and private commercial space (such as the Santa Fe Building). The ground floor has remained a central post office for the downtown business district. 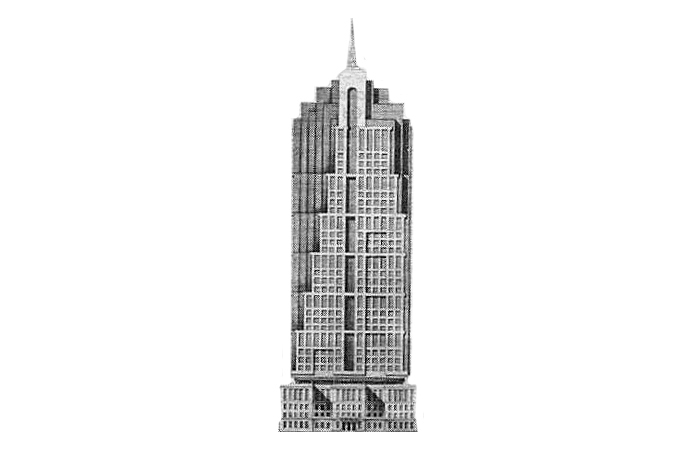 By 1945, studies for a new Federal Building were already underway. The 1971 Earle Cabell Federal Building and Courthouse once again consolidated courts and federal agencies to a new, larger structure. A new postal processing facility opened in Oak Cliff in 1976, and all operations at the Terminal Annex (along with the Postmaster and his staff at the main post office) were transfered to the new location. The U.S. District Court courtroom became the home of the newly established U.S. Tax Court; other offices were renovated and found new use. Eventually, the residential area surrounding the building (by now known as the old Post Office) would give way to towering skyscrapers as the business district moved northeast. Wanting to take advantage of business growth, in 1983 the U. S. Post Office sought a developer to construct an office building and parking garage behind and over the historic structure. A 34-story, 700,000 square foot project announced by Woodbine Development was to have included a 900-car underground garage and an atrium connecting both new and old structures. Citing economic reasons, the project never materialized (much to the relief of preservationists). The ground floor went through a more modest renovation and restoration in 2003, but upper levels were abandoned. 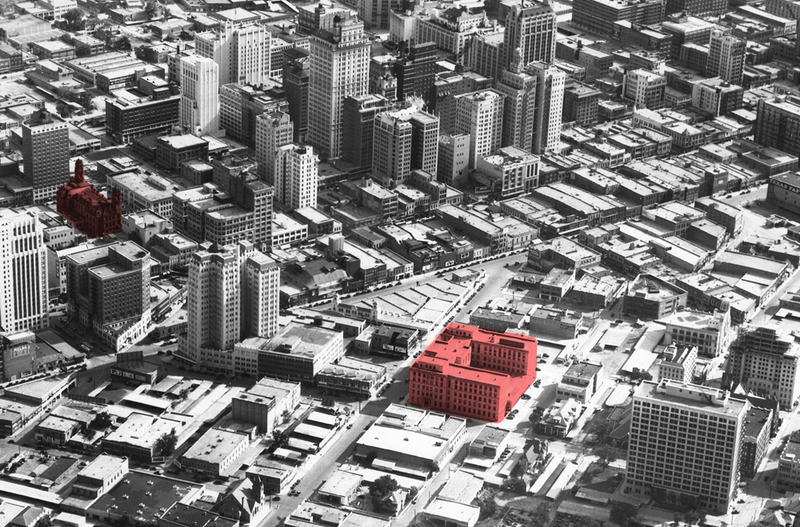 A failed proposal from the 1980s shows plans to add office space above and around the historic building. The building’s smaller size became a challenge for developers eying residential or office conversion, not to mention the challenges involved in transferring the building from Federal ownership to private property. After years of planning, developer Todd Interests purchased the building and converted the upper floors into 78 residential units. Other contributors to the project included Norman Alston Architects, Architecture Demarest, BRW Architects, Interior Ltd, Gables Development and Stashka Fine Art. Original doors have been retained along the corridors, featuring new apartments behind. Initial plans were approved by the National Park Service and construction began in early 2011. The detailed work retained the U.S. Post Office in a portion of the ground floor, restored the historic courtrooms for resident and special event space, and transformed the roof into a 20,000 square foot deck overlooking the city. Due to years of Federal ownership — and the fact that the building was exempt from local code requirements — outdated systems and fire protection systems were upgraded while being sensitive to original building features. Original terra cotta hallways, marble wainscoting and restored windows line the four levels of apartments; many of the apartments are entered through original office doorways. The adapted building preserved the historic character of the building — seen in many of the decorative finishes — and balanced that with sleek, modern features of new apartments. 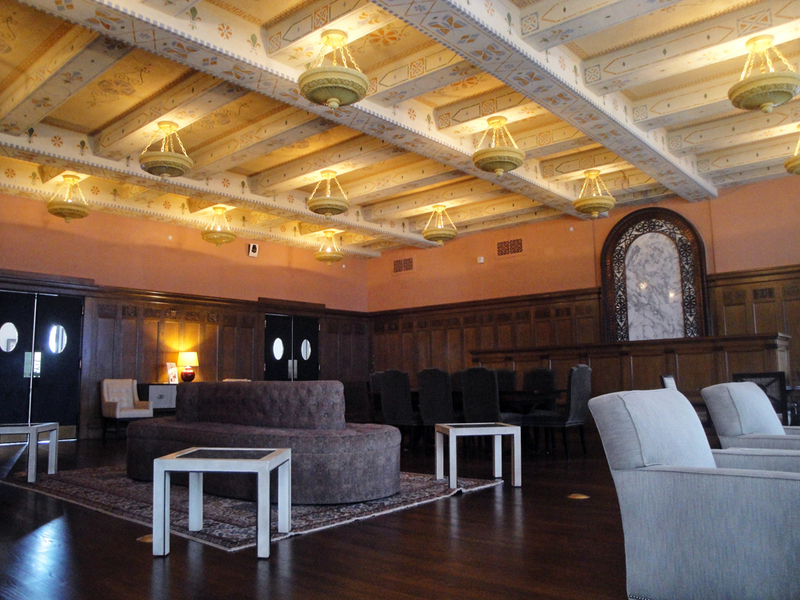 In 2012 the project won a Preservation Achievement Award by Preservation Dallas for its successful transformation. 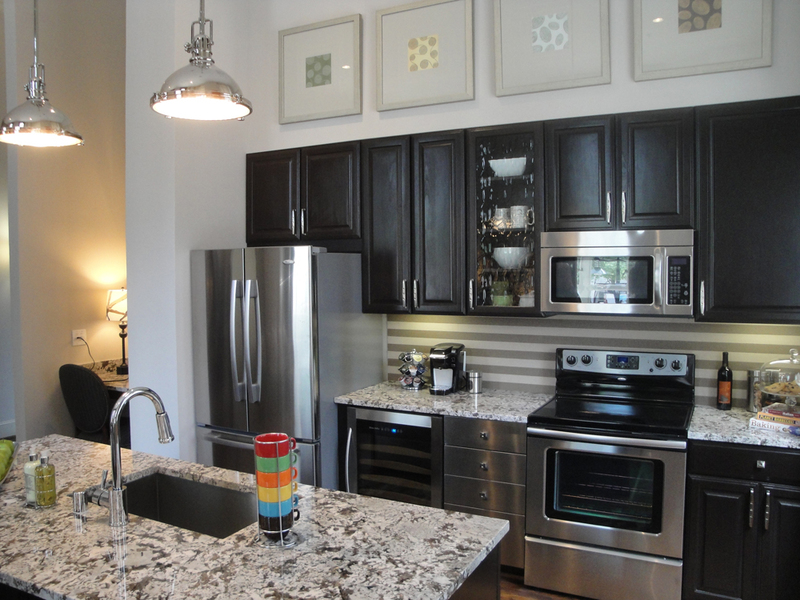 The apartments blend sleek modern furnishings with original wood floors and windows. 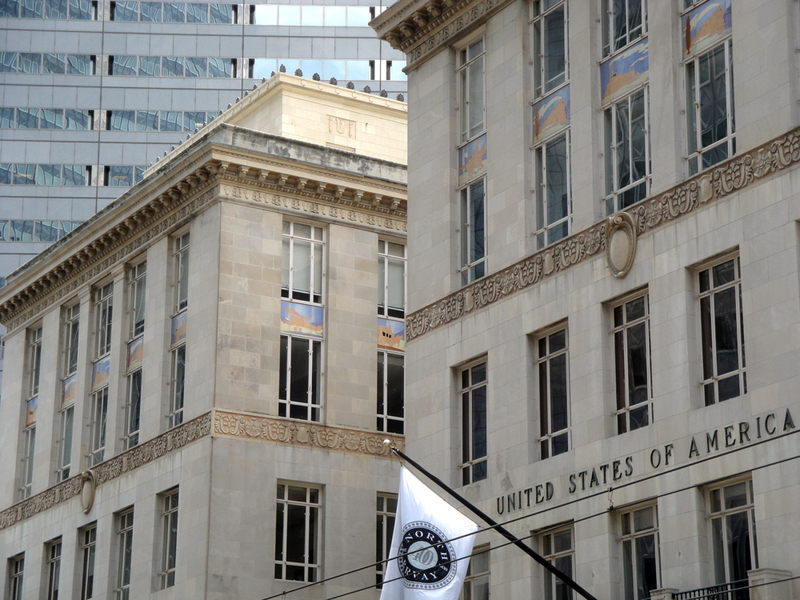 The U.S. Post Office is still active on the ground floor of the building, serving as a main collection point for downtown businesses. Other space on the ground floor is planned to house retail or neighborhood services for the growing population of downtown residents and office workers; the proximity to DART’s St Paul Station (along with the future extension of the McKinney Avenue Trolley) provides high visibility to foot traffic in this busy section of downtown Dallas. A new sign and awning on Ervay Street welcomes residents home to the new apartments. 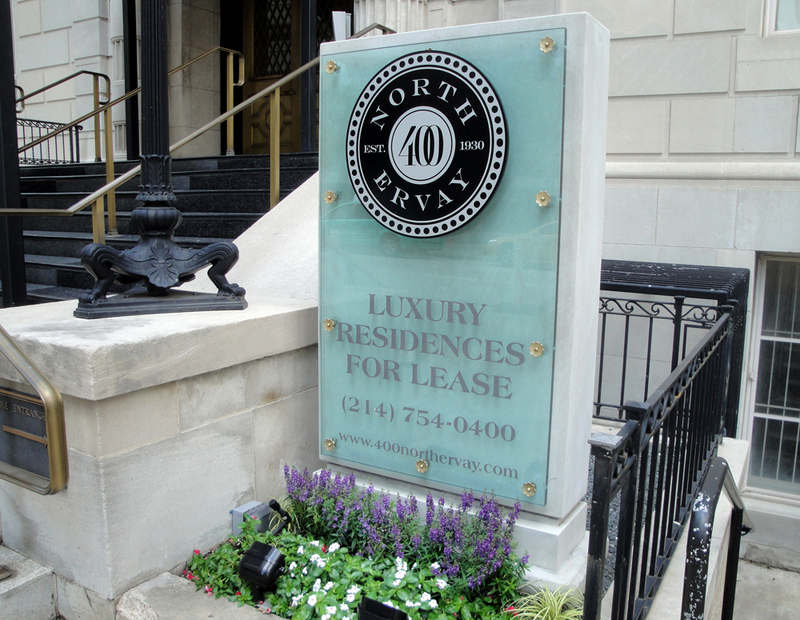 The reopening of the building as 400 North Ervay has re-imagined one of the city’s landmarks. The rebirth — much like the building’s initial construction — took time and perseverance. 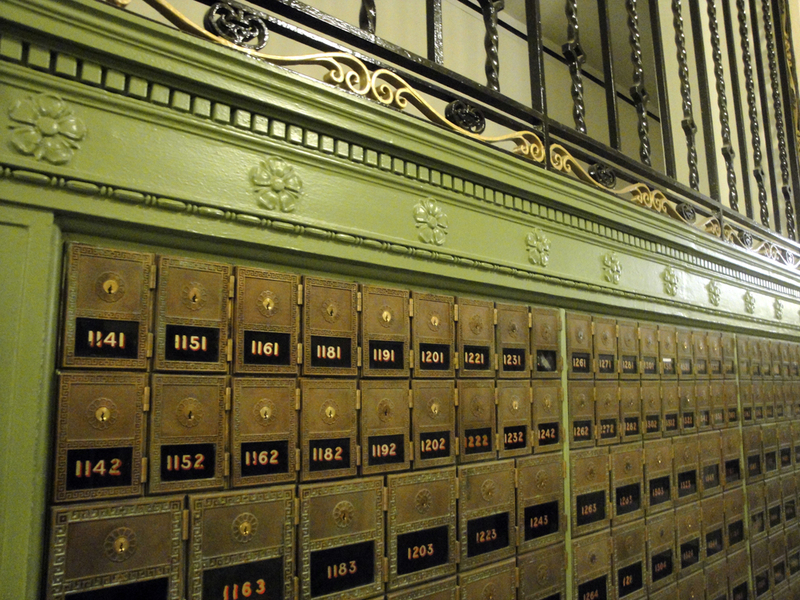 Having been restored and adapted for modern use, the U.S. Post Office and Courthouse is now enjoyed by new occupants calling this historic building home. 6 Responses to "U.S. Post Office & Courthouse"
Well done! Can’t wait to see what they come up with for retail. Fabulous job as always, Noah! I’ve lived here since January and love this place. It has a great history and awesome characteristics. It’s a solid building and glad I live in this historical building. Todd investments did an awesome job! The restoration was done very well and shows how some of our great old buildings can be adapted for modern use. I was also a happy resident of the building for a year and a half.